Your Bijoux Box is a monthly jewelry subscription box for women. With every box, you get 3 pieces of jewelry picked by Your Bijoux Box stylists. This is not a customized box – everyone gets the same 3 pieces (you can request no earrings, though). 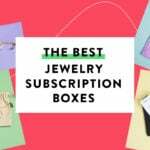 Check out all of our reviews of Jewelry Subscription Boxes for more options! Your Bijoux Box packs each piece inside its own little bag. This is perfect for gifting! The Cost: $39.99 a month + free US shipping. Save with 3, 6, and 12-month subscriptions. The Products: 3 pieces of hand-curated jewelry at your doorstep each month plus a bonus item. The December collection is filled with beautiful white opal and sparkly gold accents to jazz up any holiday outfit. Plus, the softest scarf ever is the bonus item. Let’s check them out! Here’s the info card for the December “Happy Holidays” collection. Look at all of this pretty in one place! Let’s start our opal obsession with these dainty stud earrings. The center stone is white with lots of iridescent bits and is surrounded by a halo of tiny crystals. I like the asymmetrical teardrop shape and that it’s unique and playful. The backs are wide and comfortable and because the post is in the center of the earring, they sit straight and don’t droop. If you chose to not receive earrings, you will receive a cute bracelet instead. This short, Y-style necklace can be adjusted from 16-19″ long with the dangly bit hanging 3″ longer than the top of the “Y”. The opals are small, round, and bezel-set surrounded by delicately textured beads that shimmer when they catch the light. It so hard to capture a picture of how beautiful these stones are! They almost look like they are lit from within. A second necklace is included this month and it coordinates perfectly with the earrings and Y necklace. An oval opal, that has the same iridescent effect as the ones in the earrings, hangs delicately between two crystals. I love this! In terms of size, it’s minimal, but it has just enough glitz to add some glam to any sweater. Like the Y necklace, this can be adjusted from 16-19″ in length and layers beautifully with it. Oh my goodness! This is really as soft as a kitten! The total length is about 30″, so it sits close to my neck when I pop it over my head. The material is 100% acrylic and is a chunky knit on one side and super-soft faux fur on the other. You could wear one or the other as the outside, but I prefer to twist it so it shows the different textures. The Verdict: This month, Your Bijoux Box went minimal-glam (I think I’m making that up) with simply shaped pieces with lots of pretty details. I love the opal and gold combo and am intrigued by how the opal seems to match everything I pair it with. I also am enjoying the coordinated pieces being able to be worn all together or individually. The box is so beautifully packaged and would make a great give just as it comes. Can you still get this box if you sign up today? 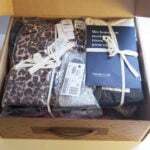 *There are a few December boxes left, so you can request to start your subscription with this box. * Otherwise, you will start with January. Usually, this subscription processes orders on the 1st of each month and ships on the 15th. Coupon – Use coupon code WELCOME to get a bonus piece of jewelry with your first box. Value Breakdown: At $39.99 for this box, the average value of each of the items would be about $10.00. 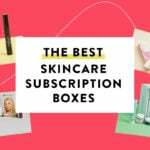 Check out all of our Bijoux Box reviews and the Women’s Subscription Box List! Did you like this month’s Your Bijoux Box? I loved this box. May have to subscribe. Nice review, your make up looks great!